Hi, MJ! I *love* that you’ve popped up that wing and the leaves on the main image panel and the little brads on the lower right corners give everything a fun little kick, too! Super, super happy! Have a blast at your workshop! Oh WOW, MaryJo! This is gorgeous! LOVE these colors! Fantastic card, MJ. I LOVE all the details. It’s major eye candy! This is beautiful! Love that bird!! Your colors are awesome..it all works so well together! Fun! Fun! Fun! Can’t wait to hear more about your top-secret stuff! Love this card – so bright and fun!! Hope your weekend flies by – and can’t wait to see what projects you’ve been working on! cute card…love the bright colors and all the colored brads!! 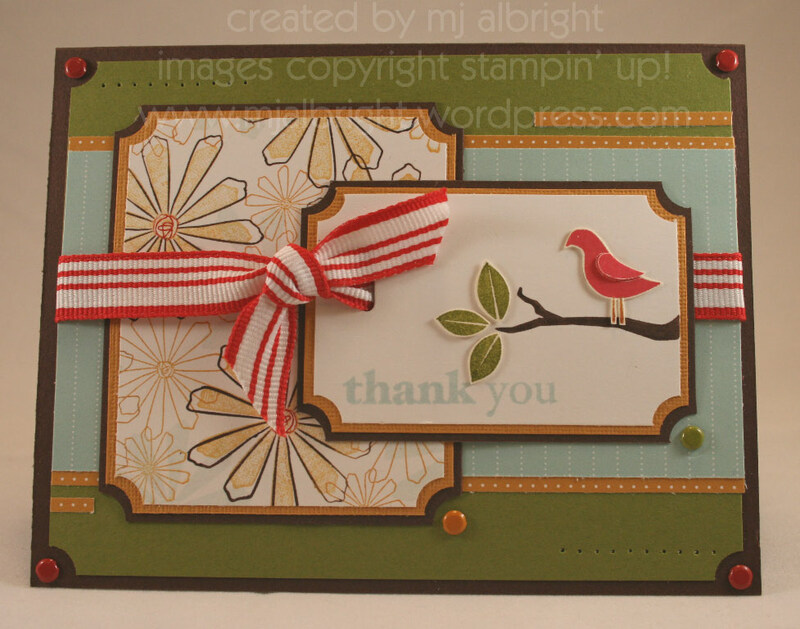 Mary Jo…this is such a beautiful card! The popped wing is such a clever accent!!! 🙂 I’m sorry you have to work….I hope at least that it a good work weekend for you…and goes by quickly!! I love your it! Everything about this card is beautiful! I especially like what you did with the ribbon and your choice of colors! Beautiful! Love all the dimension and that striped ribbon is so perfect! Such a sweet bird — love these colors, too, MJ! I hope you warm up soon and make the best of your working weekend! You know I didn’t care for this set in the catalog but you have made it look REALLY good! I love the bright happy colors. And I hope you have a great weekend despite pulling the long night shifts. I’m gonna agree with all the others! Love that popped wing! So creative. I read your blog faithfully since I found it. You are very inspiring! This is my first time commenting on your blog! Thanks for sharing your self with us! Oh, WOW! Totally fabulous in every way, MJ! I love your colors, layout, and that popped up wing! Oh my, this is soooo cute! LOVE everything about it! You’ve inspired me to get this set back out! Thanks and hugs! Beautiful card MJ! The colours are super! Beautiful..love how you stamped that bird. Fantastic colors here! Love it! How fun — wonderful color combinations!!! I love stumbling upon other cardmakers… this card wow… beautiful..you have done a great job… I love it…. Ahhh wonderful!! I love the sketch, and the colors are fab! I love using th enew striped ribbon!